A new addition to the Ayce Systems Filtration & Extraction range. This booth features PVC curtain to the front, a rear top exhaust system with axial fan, power supply switch, electrical outlet, fan operation and lighting switch. A dual filtering structure for purification, the primary filter can capture granules larger than 10um. Ceiling filter can capture granules bigger than 4um. The whole purfication system has a capacity for large volumes of dust. The filtering rate reaches 98%. Please call 01535 691888 or email sales@aycesystems.co.uk for a full quote. All prices exclude VAT at 20%. Price, availability and specification may change without prior notice. 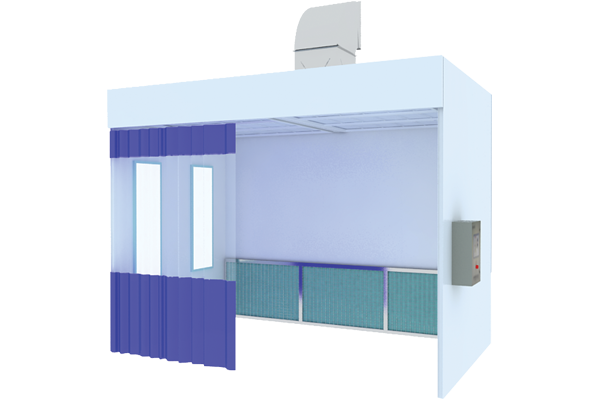 For more information about our Curtained Front Spray Booths click the button below to download the print friendly PDF brochure, or if you would like to receive a quote for this system, please click the request a quote button.